I really can’t tell you how much I love this cheap, versatile and easy recipe. These cheese and bacon savoury muffins are flavoursome, light and fluffy and quick as can be to make. I have used this recipe for a variety of purposes, including: a sugar-free and filling morning tea for the kids’ lunch boxes, mini-muffin sized ones for church morning teas and regular muffin sized numbers to pull out of the freezer to eat with soup (they freshen up beautifully after a few minutes in the oven). 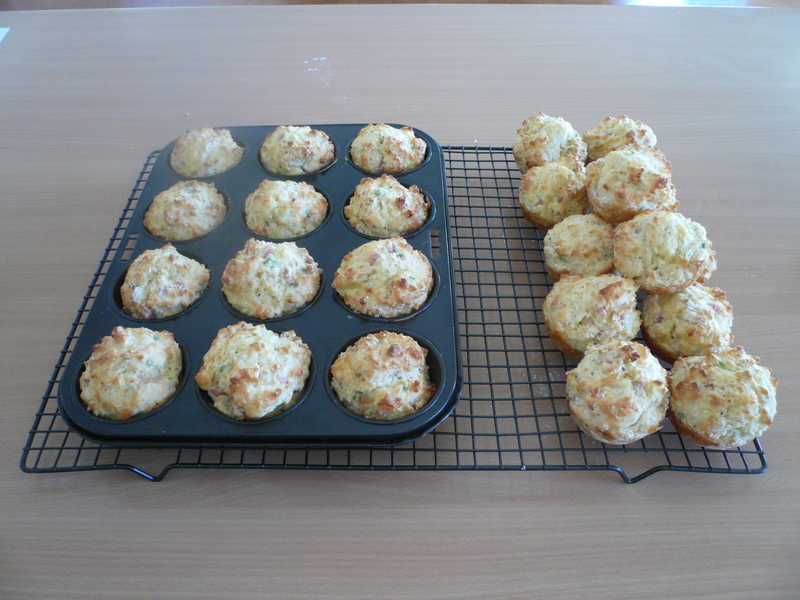 Unlike lots of savoury muffins these aren’t heavy and scone-like, they’re puffy and light. If you’d like to add other things such as grated carrot and zucchini, this recipe can certainly handle it if you add a little more milk to your mixture (the mixture should be quite a wet mixture that’s not over-mixed). When I made the ones pictured, I had little bits of un-eaten cheese in the fridge (cast-offs of swiss cheese, parmesan etc…) and so I used them all up to total the cheese component. The end result was a yummy mix of cheese flavours that would have otherwise ended up in the bin. These work really well as plain cheese muffins too, just leave out the bacon. Place grated cheese and bacon in a large bowl. Sift in flour (or not, if you couldn’t be bothered), baking powder, salt, mustard and pepper. Add herbs and sesame seeds if desired (or save the seeds to sprinkle on top). Lightly beat eggs and milk together in a jug. Make a well in the middle of the flour mixture and add the eggs and milk. Mix together gently using a knife with a cutting action so as not to over-mix. Place one heaped dessert spoon of mixture in each muffin hole and bake for 12-15 mins until muffins spring back when lightly touched. Makes 12.